Improved imaging technology is allowing three-dimensional imaging of organs during development. Here we describe a whole organ culture system that allows live imaging of the developing villi in the fetal mouse intestine. Walton, K. D., Kolterud, Å. Mouse Fetal Whole Intestine Culture System for Ex Vivo Manipulation of Signaling Pathways and Three-dimensional Live Imaging of Villus Development. J. Vis. Exp. (91), e51817, doi:10.3791/51817 (2014). Most morphogenetic processes in the fetal intestine have been inferred from thin sections of fixed tissues, providing snapshots of changes over developmental stages. Three-dimensional information from thin serial sections can be challenging to interpret because of the difficulty of reconstructing serial sections perfectly and maintaining proper orientation of the tissue over serial sections. Recent findings by Grosse et al., 2011 highlight the importance of three- dimensional information in understanding morphogenesis of the developing villi of the intestine1. Three-dimensional reconstruction of singly labeled intestinal cells demonstrated that the majority of the intestinal epithelial cells contact both the apical and basal surfaces. Furthermore, three-dimensional reconstruction of the actin cytoskeleton at the apical surface of the epithelium demonstrated that the intestinal lumen is continuous and that secondary lumens are an artifact of sectioning. Those two points, along with the demonstration of interkinetic nuclear migration in the intestinal epithelium, defined the developing intestinal epithelium as a pseudostratified epithelium and not stratified as previously thought1. The ability to observe the epithelium three-dimensionally was seminal to demonstrating this point and redefining epithelial morphogenesis in the fetal intestine. With the evolution of multi-photon imaging technology and three-dimensional reconstruction software, the ability to visualize intact, developing organs is rapidly improving. Two-photon excitation allows less damaging penetration deeper into tissues with high resolution. Two-photon imaging and 3D reconstruction of the whole fetal mouse intestines in Walton et al., 2012 helped to define the pattern of villus outgrowth2. Here we describe a whole organ culture system that allows ex vivo development of villi and extensions of that culture system to allow the intestines to be three-dimensionally imaged during their development. Each intestinal villus is composed of two main tissue compartments: an epithelial surface layer and a mesenchymal core. The mouse small intestine is formed at embryonic day 10 when a sheet of endoderm closes and seals to form a tube of epithelium surrounded by mesenchymal cells3. This flat tube of epithelium undergoes rapid proliferation, growing both in length and girth and undergoes dramatic rearrangements involving dynamic cell shape changes1. At the same time, the surrounding mesenchyme also undergoes many developmental processes including the formation of the vascular plexus, differentiation of smooth muscle and recruitment of enteric neurons4. In the proximal small intestine at embryonic day 14.5, condensations (clusters) of Hedgehog- and PDGF-responsive cells begin to form adjacent to the epithelium2,5. Formation of mesenchymal clusters continues to spread along the length of the intestine so that they cover the entirety of the small intestine by embryonic day 16.52. As mesenchymal clusters form, the epithelial cells closest to the clusters begin to withdraw from the cell cycle, while the other epithelial cells continue to proliferate. Those cells directly above the mesenchymal cluster that have withdrawn from the cell cycle begin to change shape as the emerging villus buckles into the lumen. Further growth of the villus is driven in part by the continued proliferation of the epithelium between the emerging villi. The mesenchymal clusters remain tightly adhered to the epithelium of the growing villus and continue to express a variety of signaling molecules. 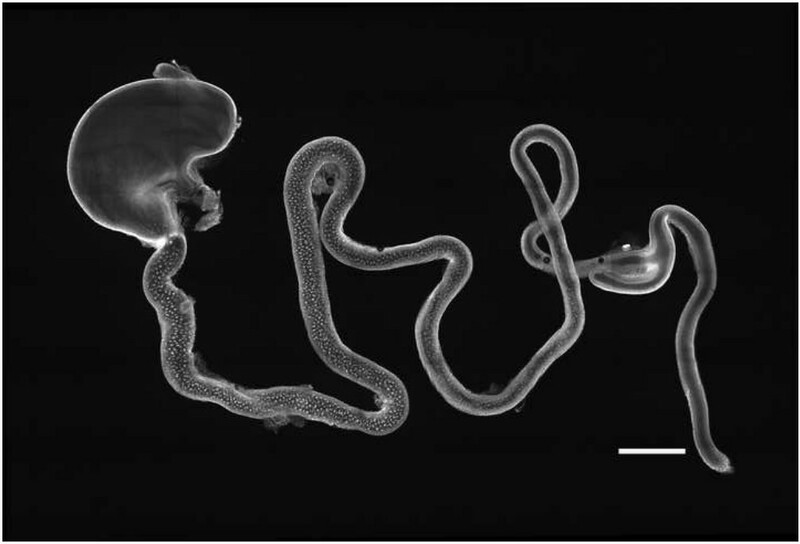 The wave of villus emergence propagates along the length of the small intestine following the formation of mesenchymal clusters. As the intestine continues to grow and the intervillus region extends between emerging villi, new mesenchymal clusters form adjacent to the intervillus epithelium and further rounds of villus emergence and growth ensue6. Synchronized development of the epithelium and mesenchyme is essential for villus morphogenesis. Signaling molecules are secreted from one layer to the other where receptors receive and transduce the signal message in order to coordinate development between the epithelium and mesenchyme. Mesenchymal clusters act as signaling centers and express a variety of developmental morphogens7-10. Disruption of cluster formation or pattern results in loss of villus emergence and pattern. Inhibition of PDGF signaling results in fewer clusters and fewer villi and those villi that do form are misshapen following the abnormal clusters11. Loss of Hedgehog signaling results in complete loss of cluster formation and failure of villus emergence2,12. Together, these data demonstrate that clusters coordinate development of the villus epithelium with its mesenchymal core. Using this whole organ culture system, we are able to alter signaling involved in epithelial-mesenchymal cluster cross-talk to determine the role of those signals in villus morphogenesis. Two-photon confocal optical sectioning and reconstruction afford the ability to visualize cluster formation and villus emergence in three-dimensions and better understand the spatial relationships between the mesenchymal clusters and their overlying epithelium. Extending the culture system to four dimensions, we can capture z-stacks of developing clusters and villi over time and observe these interactions. Ultimately, the ability to follow villus development in this manner and observe changes that occur with altered signaling will revolutionize the understanding of epithelial mesenchymal interactions in villus morphogenesis. NOTE: All mice were handled humanely using protocols approved by the University of Michigan Medical School Unit for Laboratory Animal Medicine and according to the guidelines of the University Committee on Use and Care of Animals. In a tissue culture hood, remove 5 ml of BGJb media from the stock bottle and add 5 ml of Pen/Strep. Prepare a working stock of media in a 50 ml conical tube, by adding 1 ml of 5 mg/ml ascorbic acid to 49 ml of BGJb media (with Pen/Strep). Prepare a 6 well culture plate by adding 1 ml underneath each of the transwells. NOTE: If all 6 transwells are not used, move extra transwells into a fresh sterile 6 well plate for later use. Add 3 ml of working BGJb media to each of three 10 cm sterile petri dishes. Soak dissecting tools in 70% ethanol and be sure to keep the tools clean while working. Set up the dissecting area with a large ice bucket and place the 6 well culture plate and 10 cm petri dishes with BGJb media on ice. Work on ice as much as possible while dissecting and preparing the intestines for culture. Anesthetize adult female mice in a chamber with isofluorane (100 µl) prior to euthanization by cervical dislocation for the harvesting of fetal intestines. After harvesting the fetuses from their mother, stage each fetus carefully according to the Theiler staging chart13. Do not rely on days post-coitus to determine the age of each fetus as variations of up to 24 hr in developmental stage are routinely observed within a single litter. Euthanize fetuses by decapitation prior to removal of intestines. Dissect each intestine in 1x Dulbecco's Phosphate-Buffered Saline (DPBS) and then place it into a 10 cm petri plate with working BGJb media. Carefully remove the spleen from the stomach and the pancreas from the stomach and upper duodenum. Gently separate the omentum taking care to leave the omentum attached as much as possible and separating connections only enough to allow the intestine to be straightened. NOTE: For intestines older than E14.5 or those being cultured longer than 24 hr, gently separate the intestine into 3 equal segments to allow for luminal contents to flow through the intestine and be expelled from the cut ends. However, for cultures started prior to E13.5, wait until after 24 hr of culturing before separating the 3 segments of the intestine to allow the serosa to properly grow over the length of the intestine. Use a mouth pipet to transfer the intestinal pieces onto the transwells of the culture plate (1.1.2). Gently reposition the intestines as needed so that they are straight across the transwell. NOTE: Once the intestines begin moving luminal contents through the tube, any kinks in the intestine will cause a backup and damage to the intestine. Remove the media from under the transwell, add 700 μl of treatment media (working media with added recombinant proteins or pharmacological inhibitors) under the transwell. Add 300 μl of treatment media drop-wise on top of the intestines and allow it to soak through the transwell. Reposition the intestines as necessary. Change treatment media at least once daily or more often depending on the half-life of the treatment reagent. Resuspend the agarose beads in their storage container and transfer 100 µl of agarose beads into a 1.5 ml microfuge tube. Fill the remaining volume of the tube with sterile 1x Phosphate-Buffered Saline (PBS) and mix the beads to wash them. Place the microfuge tube in a rack for a few minutes to allow the beads to settle to the bottom and then pipet off the PBS from on top of the beads. Refill the microfuge tube with sterile 1x PBS and repeat the washing process twice more. Prepare the protein of interest at two times the concentration desired for treatment. Mix 5 µl of washed agarose beads with 5 µl of the 2x protein stock and gently agitate the beads in the protein. Place the tube on ice for 1 hr, mixing gently every 10-15 min. Rinse the beads briefly in sterile 1x PBS before placing the beads on the intestines. Gently place the agarose beads on top of the intestines using a mouth pipet with pulled capillary needles. Place the beads with extreme caution as rough handling will damage the intestine and prevent villus development in the injured area. Place twice as many beads as are needed for analysis since the intestines will undergo peristaltic movements and about half of the beads placed will roll off of the intestines over the culturing time. Carefully remove the treatment media from below the transwell and allow the intestines to air dry for 3 min. Add 1 ml of fixative under the transwell for 2 min, then cover the top of the intestine with 2 ml of fixative for the remainder of the fixation time. Fix with 4% paraformaldehyde O/N at 4°C or for 2 hr at RT. Place the whole intestines (with endogenous fluorescence) on a slide with 100 µl of 1x DPBS. Use forceps to gently arrange the intestines. Use a lab tissue to carefully remove the DPBS and immediately add 100 µl of 70% glycerol to make the tissue more transparent and increase the possible depth of imaging. NOTE: If further penetration of the intestine is desired, instead of mounting the intestine in 70% glycerol, soak the intestine in a few drops of Focus Clear solution for 10-30 min. Pipet off the Focus Clear solution and mount the intestine with Mount Clear. Dip each of the four corners of a coverslip into modeling clay and pick up a small amount of clay to use as spacers between the slide and coverslip to keep the coverslip from flattening the intestine. Seal the coverslip onto the slide with melted VALAP applied with a cotton swab. Image the intestines on either an upright or inverted confocal microscope. Please refer to the discussion for further details. Embed intestines in 7% agarose in small plastic molds (10 x 10 x 15 mm) and allow the agarose blocks to cool and solidify. Remove agarose blocks from the plastic molds and glue agarose blocks to the vibratome collection stage with instant glue. Fill the collection stage with ice cold 1x DPBS. Cut sections at a thickness between 100-150 µm. For thicker sections use clearing solutions (described in section 2.1.2) to visualize deeper into the cross-section. Pour vibratome sections from the collection stage into a well of a 6-well plate for storage at 4 °C. Place 5-12 vibratome sections per well into a 24-well plate with 1x DPBS. Remove 1x DPBS and add 500 µl of permeabilization solution per well. Gently rock the samples for 25 min at RT. After permeabilization, wash the samples 3 times with 1x PBS. Block the samples for at least 30 min in 500 µl of Blocking Solution. After blocking, exchange the blocking solution with 500 µl of primary antibodies diluted in blocking solution and keep the samples at 4 °C O/N. NOTE: The primary antibody dilutions that work well on frozen and paraffin sections generally work well on vibratome sections too, however antibodies requiring nuclear antigen retrieval generally do not work well with this protocol (e.g., BrdU). The following day, wash the samples 3 times for 15 min each time with blocking solution. After washing, apply 500 µl of the secondary antibody diluted in blocking solution. Wrap the 24-well plate in aluminum foil to protect the fluorophores from light and rock the samples for 45 min to 2 hr at RT. Wash the samples 3 times with 1x PBS for 15 min each and mount the vibratome sections on slides as described in Section 2.4. Prepare slides for vibratome mounting by cutting thin slices of double-stick tape and placing them along the long sides of the slides. Carefully place 5-10 vibratome sections between the double-stick tape on the slides in a drop of 100 µl of 1x PBS. Unfold all sections and spread them out into a single layer across the slide. Remove any excess agarose or uneven bits that would prevent a coverslip from sitting flat. Carefully use a lab tissue to soak up excess 1x PBS from around the vibratome sections. Add a drop of aqueous mounting medium on top of the vibratome sections and then coverslip. Seal the coverslips onto the slides with melted VALAP applied with a cotton swab. Image the vibratome sections on either an upright or inverted confocal microscope. Please refer to the discussion for further details on selection of an imaging system. Intestines harvested from fetuses after E12.5, with the connected omentum left intact, successfully develop villi in culture using the above system. Therefore, this ex vivo system permits the capture of live z-section images of the developing intestines which can be reconstructed for a three-dimensional view of morphogenesis over time. Use instant glue to adhere an individual polycarbonate membrane to a fine mesh screen. This provides a support scaffold to hold the intestine in place below the dipping lens of the upright confocal microscope. Please refer to the discussion section for further details on selection of live imaging microscopes. Place the mesh screen in the center well of a culture plate. Place the dissected intestine onto the polycarbonate membrane and add a drop of instant glue at either end. Use only enough glue to affix the intestine, but not coat it! Add culture media free of phenol red below the polycarbonate membrane in the center well of the culture plate. Add water to the outer rim of the culture plate to provide humidity. Since the fetal intestine undergoes peristaltic-like waves of contraction in culture, add 100 μl of a 1:5 solution of xylazine in 1x PBS to 3 ml of media to control movement of the intestine while imaging. This dosage will control intestinal movements for about 8-10 hr without compromising villus development. For a transverse view of the intestine, embed the live intestines in a 3-4% agarose solution and cut thick sections (150-500 µm) on a vibratome. Match the rigidity of the agarose with the stiffness of the intestine being cut and empirically determined the developmental stage. Generally, a 3% agarose solution works well for intestines younger than E14.5 and a 4% solution works well for intestines E15-E16. Glue the vibratome sections to a polycarbonate membrane affixed to a mesh screen (as in Section 3.1.1) and culture as described in Section 3.1.2-3.1.6. Conduct the live imaging using a two-photon confocal fluorescence microscope (excitation laser between 690-1,040 nm) on an upright stand with a tunable table. Two-photon laser tuned to 900 nm provides deep penetration with the best resolution for GFP signals. It reduces damage to tissues while imaging. In addition, setting the power of the laser to the lowest possible emission reduces tissue damage. Typically to obtain a good excitation of GFP, use 12% power on the two-photon laser. Culture of whole explants of fetal intestines allows for the analyses of the location, distribution, and duration of the signaling molecules that coordinate intestinal development, as this system enables the manipulation of the signaling with pharmacological reagents or recombinant proteins. The transwell culture system (Figure 1A, reproduced from Walton et al., 2012)2 provides an air-liquid interface, which makes it possible to place drug- or protein soaked agarose beads onto the tissue and thereby establish local signaling sources (Figure 1B). Intestines harvested from embryos at E10 to E18.5 survive in culture on transwells and undergo peristaltic-like waves of movement. Intestines started in culture from E13.5 survive approximately 10 days or roughly to P3, the stage of mouse development when crypt formation is first observed. Though early stage intestines survive in culture, intestines harvested prior to E12.5 do not emerge villi reliably, likely because the serosa has not grown to completely cover the intestine by that time. Mesenchymal clusters form and villi begin to emerge and lengthen in intestines started in culture at E12.5, E13.5 or E14.5, though development is slightly delayed as compared with uncultured, stage-matched controls (Figure 1, reproduced from Walton et al., 2012)2. Regardless of the stage of the intestine at the start of culture (E12.5-E14.5), the intestines always appear have an approximate delay of 24 hr. E14 intestines grown in culture for two days show growth of villi that are more similar to those of E15 intestines than villi of E16 intestines grown in utero (Figure 1C-F)2. The regular pattern of mesenchymal clusters is revealed by three-dimensional reconstruction of optical sections of a whole PDGFRαGFP/+ intestine at E15.5 (Figure 2, reproduced from Walton et al., 2012)2. This image consists of z-stacks of 54 fields of view that were stitched together by the Leica LAS-AF software. Each spot inside the intestine is a mesenchymal cluster visualized by nuclear tagged GFP expressed from the PDGFRα locus14. The high resolution of the image allows the viewer to zoom-in to certain areas to examine details, yet provides in depth spatial relations that cannot be gleaned from single fields of view or lower power magnification. Movie 1 is a series stepping through the stitched z-stack images that are 3D reconstructed in Figure 2. The individual optical sections allow for further visualization of details such as single cells within the clusters. Optical sections of wholemount immunofluorescence of intestinal vasculature with PECAM antibody (BD Pharmingen 557355; diluted 1:1,000) were captured using two-photon excitation and reconstructed with Imaris software (Figure 3). This three-dimensional view of the intestinal blood vessels reveals an intricate network of vasculature that cannot be fully appreciated by thin section preparations. Movie 2, a rotating three-dimensional projection of the reconstructed image in Figure 3, allows for further appreciation of how the increased information by provided three-dimensional reconstruction can improve the understanding of structural patterning. Vibratome sectioning allows for three-dimensional viewing of the intestine from a transverse vantage. 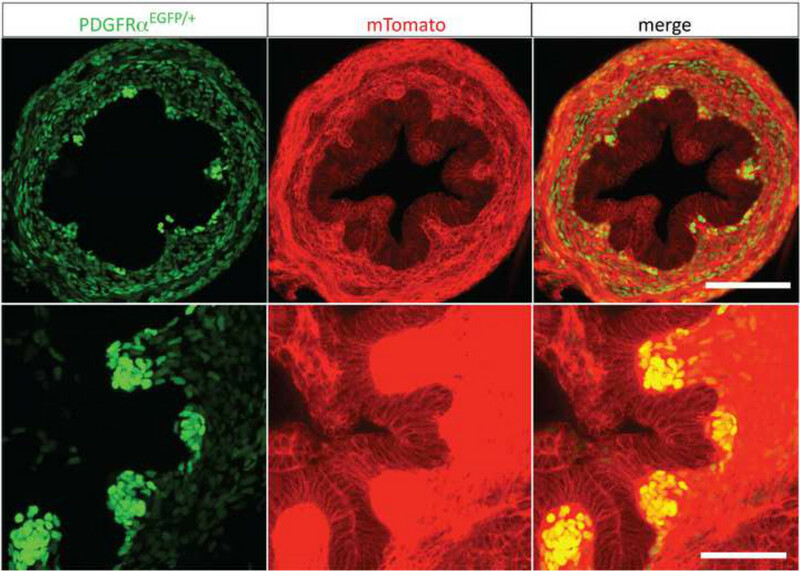 In Figure 4, the relationship of the developing clusters (marked with PDGFRαGFP/+)14 with the epithelium and surrounding mesenchyme (marked with membrane Tomato (Rosa26mT/mG)15 is observed. Alternatively, this relationship can be viewed by antibody immunofluorescence staining (Figure 5) of the mesenchymal clusters (green, labeled with anti-PDGFRα (SantaCruz C-20; diluted 1:200)) with the epithelium (red, labeled with anti-Ecadherin (BD Transduction Labs 610181; 1:1,000 dilution). This whole organ culture system can also be extended to allow for two-photon imaging of developing fetal intestines. In this set-up, the fetal intestine is glued to a polycarbonate membrane supported by a mesh screen in a larger culture plate (Figure 6). The larger well size of the culture plate allows for the confocal microscope lenses to contact the intestine inside well. Figure 1. Development of whole fetal intestines in a transwell culture system. (A) Fetal intestines placed on a transwell membrane in a 6 well culture plate with BGJb media. Top two intestines are E12.5, bottom two intestines are E13.0. (B) Bovine serum albumin soaked agarose beads (lighter blue) placed on a duodenum in the transwell culture system. The darker blue stain is X-gal staining for PtcLacZ/+ in the Hedgehog reporter mouse line marking mesenchymal clusters16. (C-F) Cross-sections of freshly harvested E14.0 (C), E15.0 (D) and E16.0 (E),duodenal tissue stained with E-cadherin (green) and DAPI (blue). At E14.0, the unremodeled epithelium is still pseudostratified, while at E15.0 and E16.0, nascent villi are visible. (F) An intestinal segment identical to that seen in (C), but cultured for two days (E14 + 2days) demonstrates that villi develop in culture, though slightly delayed. Panels (C-F) are reprinted from Walton et al., 20122. Scalebars are 50 μm. Please click here to view a larger version of this figure. Figure 2. Three-dimensional reconstruction of stitched fields of z-stacks from an E15.5 wholemount PDGFRαEGFP/+ intestine. The image is a partial reconstruction (five 1 μm sections from the center of 65 z-sections) from 54 stitched fields of view captured using the motorized stage of the LeicaSP5X confocal microscope on an inverted DMI 6000 stand with two-photon laser excitation at 900 nm. Leica LAS-AF software stitched the Z-stacks together to form the whole image. Scalebar is 1 mm. Figure 3. 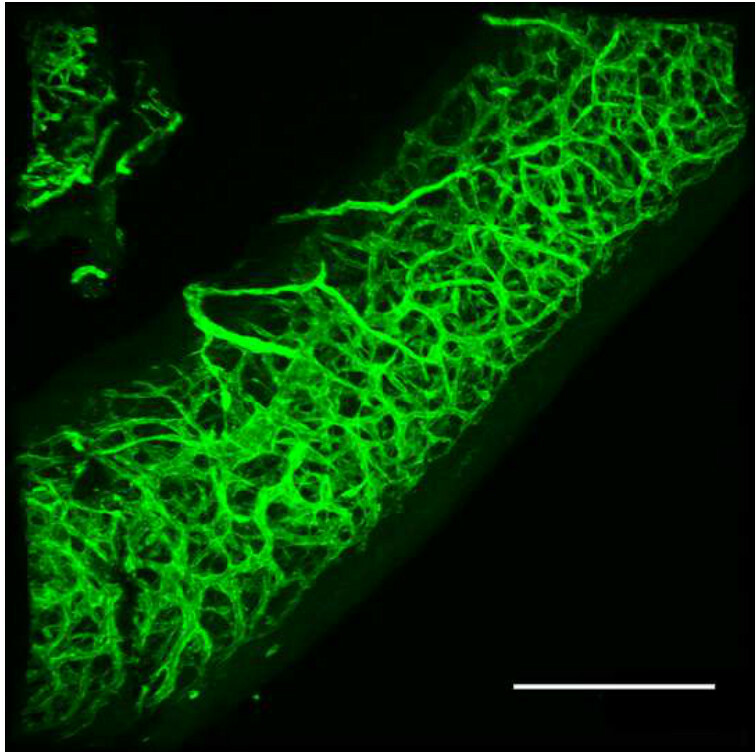 Three-dimensional reconstruction of optical sections showing wholemount anti-PECAM immunofluorescence of intestinal vasculature in an E14 duodenum. Optical sections were captured on a LeicaSP5X confocal microscope on an upright DMI 6000 stand with two-photon excitation at 900 nm and three-dimensionally reconstructed using the Imaris 7.6.1 software. Scalebar is 200 µm. Figure 4. Confocal images of vibratome sectioned E15.5 PDGFRαEGFP/+; Rosa26mTmG jejunum showing the close association of the PDGFRαEGFP/+ cells of the mesenchymal clusters (green) with their overlying epithelium and surrounding mesenchyme (red; membrane Tomato from Rosa26mTmG). Scalebars are 50 µm in the upper panels and 25 µm in the lower panels. Figure 5. Three-dimensional reconstructions of confocal images from E15.5 vibratome sectioned intestines that were antibody immunofluorescence stained. Scalebar is 50 µm. Figure 6. Adaptation of the transwell culture system for 2-photon live imaging. (A) Mesh screen is placed in a culture dish. (B) Polycarbonate membrane is glued to the mesh screen. (C) Intestines are glued to the polycarbonate membrane and cultured with phenol-free DMEM media. Movie 1. Movie stepping through the entire Z-stack of the wholemount PDGFRαEGFP/+ intestine in Figure 1. Movie 2. Rotating movie showing the three-dimensional reconstruction of the optical sections of PECAM stained vasculature in the E14 duodenum in Figure 2. The dynamic nature and complex tissue interactions of the developing intestine requires 3D visualization to have a full appreciation of these morphogenetic events. With evolving imaging technology, the ability to examine villus morphogenesis in detail is developing/improving and with it, the understanding of the spatial communication and interaction during organogenesis is greatly enhanced. Alternative methods for culturing whole intestines have also been tested, but the transwell system remains the most reliable for longer culture times and for maintaining normal cluster and villus patterning. 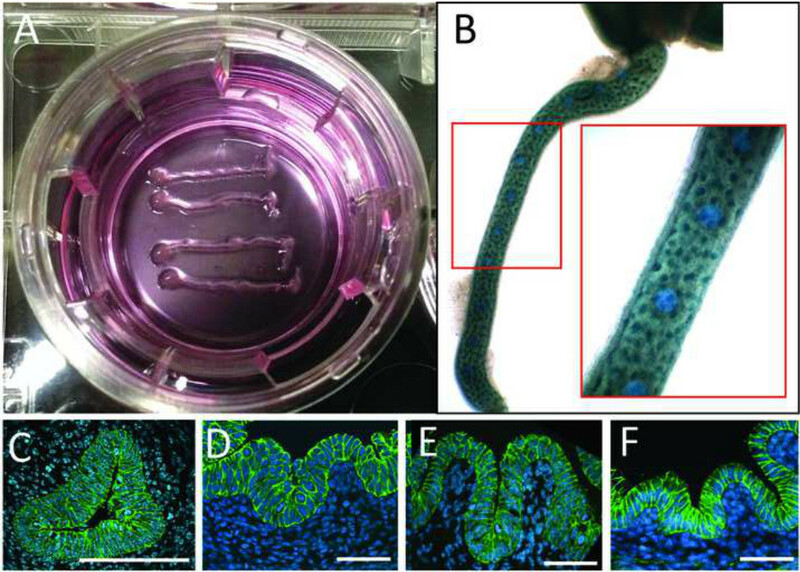 Three-dimensional culture systems (matrigel or collagen) work well for short culture periods (less than 24 hr) of younger intestines (E12.5-E15.5), but once the intestines begin undergoing peristaltic-like movements and secreting enzymes and waste into the lumen, the three-dimensional substrates do not hold up well. Intestines in liquid cultures will also develop, however, the lack of support or reference for orientation in a free-floating culture appears to alter normal pattern of the clusters and villi. Therefore, the transwell system is preferred to examine cluster patterning and villus emergence and outgrowth. Another method for wholemount live imaging with a less rigorous set up is to use minutien pins to affix the fetal intestine to a thin layer of 7% agarose on the bottom of a 35 x 10 mm plate. While this method is easier to set up, note that its use is limited to younger stages (E12.5-E15.5) or for shorter culturing times since the matrigel will not hold up to intestinal secretions. To prepare the culture plates, pour enough melted 7% agarose to just cover the bottom of a 35 x 10 mm plate. Place a glass capillary tube in the center of the agarose while it is still malleable. Once the agarose has solidified, remove the glass capillary and place the fetal intestine along the well created by the capillary. Fill the capillary well with matrigel to surround the intestine and place the culture dish at 37°C until the matrigel sets. Add phenol red-free DMEM culture media carefully. Place the 35 x 10 mm plate inside a 60 x 15 mm plate and fill the 60 mm plate with water to create a humid chamber. Selection of the mounting method (wholemount or vibratome) for live imaging is based upon the desired orientation of the area to be visualized. For example, to view changes in epithelial cell shape, z-stacks through a wholemounted intestine will provide views of the apical and basal surfaces. To view interkinetic nuclear migration of the epithelial cells within the epithelial sheet, vibratome sections allow an end on (transverse) view to observe the apical and basal surfaces. Preparation of the samples is critical to yielding the best imaging results. When using vibratome sections and standard confocal microscopy, good resolution can be achieved up to depths of 75 μm without a clearing reagent. Currently, a clearing reagent for live samples has not been identified so the depth of imaging is limited. For fixed samples, the use of a clearing reagent can greatly improve the depth of imaging. The clearing reagent found to provide the best morphology and resolution was Focus Clear17. After 30 min of clearing in Focus clear and mounting in Mount clear, the entire depth of all stages of embryonic intestines can be imaged with excellent resolution. A less expensive clearing alternative is 70% glycerol, however the maximal depth of penetration in embryonic tissues is 150 m, thereafter the resolution and intensity of signal is lost. One important note is that signals are most defined in samples that are mounted and imaged on the same day the staining was completed. Mounting with signal preserving aqueous mounting medium (such as Prolong gold anti-fade solution (Life Technologies P36930) does help with preserving the signal, but only briefly; the clearest images are always obtained immediately after staining and mounting the samples. We gratefully acknowledge Dr. Deborah L. Gumucio as our advisor and for her invaluable support in defining the culture and imaging methods. We also thank Dr. Jim Brodie, Dr. Hong-Xiang Lu, Dr. Charlotte Mistretta, and Dr. Ann Grosse for their contributions to the development of the whole intestine organ culture system. Helpful discussions on imaging provided excellent advice from Dr. Chip Montrose, Michael Czerwinski and Sasha Meshinchi. All imaging was performed in the Microscopy and Image Analysis Laboratory at the University of Michigan. Funding support was provided by NIH R01 DK065850. Mouth pipet (Drummond 1-15 inch aspirator tube assembly) Fisher 21-180-10 remove the aspirator assembly and replace it with a 1,000 µl pipet tip which acts as an adaptor to plug in a 6 inch glass Pasteur pipet. Grosse, A. S., et al. Cell dynamics in fetal intestinal epithelium: implications for intestinal growth and morphogenesis. Development. 138, 4423-4432 (2011). Walton, K. D., et al. Hedgehog-responsive mesenchymal clusters direct patterning and emergence of intestinal villi. Proc Natl Acad Sci U S A. 109, 15817-15822 (2012). Wells, J. M., Melton, D. A. Vertebrate endoderm development. Annu Rev Cell Dev Biol. 15, 393-410 (1999). Hashimoto, H., Ishikawa, H., Kusakabe, M. Development of vascular networks during the morphogenesis of intestinal villi in the fetal mouse. Kaibogaku zasshi Journal of anatomy. 74, 567-576 (1999). Mathan, M., Moxey, P. C., Trier, J. S. Morphogenesis of fetal rat duodenal villi. Am J Anat. 146, 73-92 (1976). Burns, R. C., et al. Requirement for fibroblast growth factor 10 or fibroblast growth factor receptor 2-IIIb signaling for cecal development in mouse. Dev Biol. 265, 61-74 (2004). Pabst, O., Schneider, A., Brand, T., Arnold, H. H. The mouse Nkx2-3 homeodomain gene is expressed in gut mesenchyme during pre- and postnatal mouse development. Dev Dyn. 209, 29-35 (1997). Pabst, O., Zweigerdt, R., Arnold, H. H. Targeted disruption of the homeobox transcription factor Nkx2-3 in mice results in postnatal lethality and abnormal development of small intestine. Development. 126, 2215-2225 (1999). Kaestner, K. H., Silberg, D. G., Traber, P. G., Schütz, G. The mesenchymal winged helix transcription factor Fkh6 is required for the control of gastrointestinal proliferation and differentiation. Genes & Development. 11, 1583-1595 (1997). Madison, B. B., McKenna, L. B., Dolson, D., Epstein, D. J., Kaestner, K. H. FoxF1 and FoxL1 link hedgehog signaling and the control of epithelial proliferation in the developing stomach and intestine. J Biol Chem. 284, 5936-5944 (2009). Karlsson, L., Lindahl, P., Heath, J. K., Betsholtz, C. Abnormal gastrointestinal development in PDGF-A and PDGFR-(alpha) deficient mice implicates a novel mesenchymal structure with putative instructive properties in villus morphogenesis. Development. 127, 3457-3466 (2000). Mao, J., Kim, B., Rajurkar, M., Shivdasani, R., Mcmahon, A. Hedgehog signaling controls mesenchymal growth in the developing mammalian digestive tract. Development. 137, 1721-1729 (2010). Theiler, K. The house mouse. Development and normal stages from fertilization to 4 weeks of age. 2, Springer-Verlag. (1989). Hamilton, T. G., Klinghoffer, R. A., Corrin, P. D., Soriano, P. Evolutionary divergence of platelet-derived growth factor alpha receptor signaling mechanisms. Mol Cell Biol. 23, 4013-4025 (2003). Goodrich, L. V., Milenkovic, L., Higgins, K. M., Scott, M. P. Altered neural cell fates and medulloblastoma in mouse patched mutants. Science. 277, 1109-1113 (1997). Fu, Y. Y., et al. Microtome-free 3-dimensional confocal imaging method for visualization of mouse intestine with subcellular-level resolution. Gastroenterology. 137, 453-465 (2009).